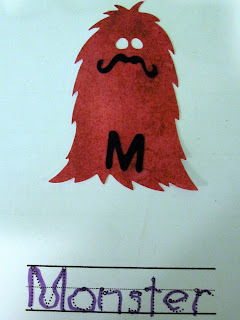 Monster and Mustache!!! I totally didn't post this little guy when I was talking about M last week! Oh well, here you go. This is what we had the kids make for our alphabet book. Super easy. Shelley cut them with the cricuit and then we had the kids glue the letter M and the mustache on.